The Vatican was lobbied by the British ambassador in Dublin and officials in Belfast to issue a papal statement denouncing the IRA in the 1990s, government files have revealed. The statement denouncing the IRA was to be read at Masses across Ireland. Support for British policy and a plea for Catholics to join the hated RUC police force was also a likely part of the statement. The British were leaning heavily on the words and tacit support of then-Cardinal Cahal Daly who had urged Catholics to join the RUC and denounce the IRA. IrishNews.com reports that the idea of a papal statement was first mentioned in a letter between two Northern Ireland Office (NIO) officials in January 1990. It was then discussed later in a meeting between the British ambassador, Sir Nicholas Fenn, and Archbishop Emmanuel Gerada, who was at the time the new Papal Nuncio to Ireland. Read More: British government admits to losing Northern Ireland documents from the National Archive. The statement should condemn violence by the IRA as well as support the British government policies in Northern Ireland. 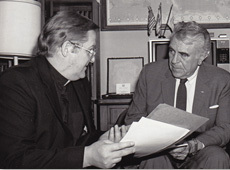 Blackwell went on to suggest that the nuncio might encourage the recruitment of Catholics into the Police Authority and security forces, highlighting Bishop Cahal Daly’s support for Catholics joining the RUC. Fenn would recall that in conversation Burns had “distinguished between the consistently humane, enlightened and compassionate Cahal Daly and the less helpful… Cardinal Ó Fiaich and Father Des Wilson [the west Belfast-based human rights activist]”. However, Daly has been slammed for his role on this issue by American-based Father Sean McManus, who has called Daly a “gombeen” or stooge of the British during this period of The Troubles. 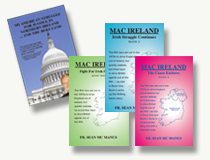 McManus is the founder of the Irish National Caucus. “Well, they would, wouldn’t they? Of course, the British Government would praise Cardinal ‘ Gombeen’ Daly—he was their man. “The Brits also lobbied the Vatican to excommunicate the Fenians in 1870.